Originally founded by Edward Lewis in England. Decca came to the US in 1934. The first US Decca label was a Sunburst design but that design disappeared in 1937. The sunburst design was replaced by a Decca in block lettering. The pre—WW2 Decca in block-lettering can be found in mainly blue and red. During World War II not only did the block lettering disappear in favor of a scripted Decca, but the color changed to black and gold. Post-WW2 found Decca going back to block-lettering while keeping the black and gold colors. Decca would also invest in a new type of plastic called Deccalite which can found on post-ww2 records. Deccalite is similar to vinyl which has a tendency to be less breakable than shellac. In 1949, Decca would adopt the LP format and then 45s but continued to press 78s until 1958. In the 1949 , Decca would produce a budget label called Coral. Coral records would be used to press jazz and swing bands (some were new bands but most were re-pressings of older music) in a 78 format. However, as America pushed into the 1950s new music such as Rock and Roll would find a home on Coral (especially Buddy Holly) as well as the new musical formats: LPs and 45s pressed in vinyl. Pre-World War II: Labels that are pre-WW2 come with either a Sunburst design or block-lettering. 1937 Decca Sunburst design. Blue color. Pre-WW2 (1937-1941): Block lettered Decca. Red color. Pre-WW2 (1937-1941): Block lettered Decca. Blue color. World War II: Records produced during the war (from either shellac sources bought openly on the market or from shellac reserve) had a scripted logo colored in black and gold lettering. Post World War II: Decca returned to the block lettering of the 1930s but kept the black and gold colors. Decca would by the late 1940s/1950s create a new label called Coral to tap into the new Rock and Roll market. Coral Records and Decca records would phase out shellac-based 78s records in favor of vinyl (or what Decca describes as “Deccalite”) on the new 45 and 33 formats. 1954. Post-WW2 records will have a mention of 45 RPM and/or have a tri-center or quad-center label to enable the record to play in a 78-record player. Notes: The Andrew Sisters will always be found on the Decca label. Count Basie and his Orchestra along with Woody Herman both first recorded under the Decca label. Count Basie first recorded in 1937 with the songs Honeysuckle Rose and Pennies from Heaven. However, in late 1936, Count Basie did a side-project under the pseudonym: Jones-Smith Incorporated. He released 4 songs: “Shoe Shine Boy”, “Evening”, “Boogie Woogie”, and “Oh, Lady Be Good”. These songs can be found on Vocalion. Woody Herman first recorded with Decca in 1936 but did not have a hit until WoodChopper’s Ball. Buddy Holly and the Crickets first recorded on a Coral Label (Though Buddy Holly himself first recorded on Decca). 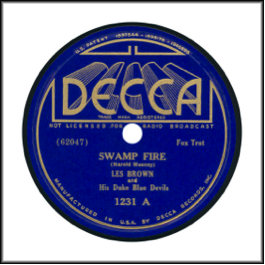 Decca is considered to be the first record company to press and market Broadway showtunes. The first Broadway showtune commercially available for the public was 1943’s Oklahoma! Contained in each Oklahoma! Decca set was a booklet about the musical.